← E-residency – the beginning of a new era or the end of citizenship as we know it? Reading the press headlines all over Europe today, one gets the impression of a schizophrenic Europe, with images of glory and gloom about what Syriza’s win means for the future of the Eurozone being painted by different newspapers. On the one hand, the win of the left party is constructed as the win of hope over strict austerity and its grave consequences, and the answer of the long-suffering Greeks to the policies of Brussels. This answer gives hope to the Left around Europe, from Spain’s Podemos, who have closely supported Tsipras, to UK’s Labour Party. On the other hand, the elite press highlights the risk of a rekindling of the crisis and the possibility of a ‘Grexit’, if Tsipras sticks to his position of renegotiating the terms of the Greek bailout and getting rid of the Troika. The image and the sentiment in Greece is much more complex than these two opposing narratives. Syriza’s win is indeed a historic moment for the country, which is to be governed by a party of the radical left for the first time in its history. Another important reason to celebrate is that the two parties that have monopolised power over the last thirty years through a system of corruption, clientelism and nepotism are for the first time left out of government, with PASOK receiving a mere 4,7 % of the votes, and facing oblivion. Illustrative of this tremendous change is the fact that for the first time in the last forty years a member of the Papandreou family is not in the Parliament. The last one was George Papandreou, the PASOK Prime Minister who signed the memorandum for the first Greek bailout in 2010, and participated in the last elections with his own new party, the Movement of Democratic Socialists, which failed to enter the parliament. But apart from the supporters of Syriza, the majority of Greek people, even those who did vote for the party, do not probably feel like celebrating today. The result of the election is not only a huge win for the Left but also the reflection of the frustration and disenchantment of the Greek public with the practices and failures of the political system over the last forty years. Tsipras has not necessarily convinced the majority of Greeks that he is the right answer for the future of the country; but the rest of the parties have convinced them that they are not. This does not mean that Syriza’s win is any less significant; but it implies that the political climate in Greece is not so much of a turn towards the Left as a turn away from the politics of the Metapolitefsi and the grave situation it has led the country into. For a part of the population, this turn has been towards the far-right. Golden Dawn, the neo-nazi party whose leadership along with the majority of its MPs are currently in jail awaiting trial for a number of criminal activities, is the third party. This is an important piece of news that has gone rather under-reported in the post-election celebrations. Golden Dawn is a symptom of the deep social turmoil the country has undergone over the last years. But it is not a symptom that will be easily alleviated, even when – and if – the Euro crisis will come to an end. The entry of Golden Dawn in the parliament has legitimised racist and xenophobic sentiments that might have sparsely existed in the country long before but found space for expression for the first time. Dealing with these voices and marginalising them once again will be a hard and long-term task. Tsipras’s government will have to take this task seriously, on top of the challenges of dealing with the country’s debtors, in order to implement the social agenda Syriza promoted before the election. Even this social agenda, however, seems to be compromised in the choice by Tsipras to form a government coalition with the Independent Greeks, a nationalist, conservative right-wing party. Founded by a former member and constituted mostly by former deputies of the conservative New Democracy, the only obvious point of agreement between the Independent Greeks and Syriza seems to be their anti-austerity stances. At the same time, however, the Independent Greeks stand for a national education centred on Christian Orthodox values and have explicitly nationalist, anti-immigration and even anti-Semitic positions. How this coalition will work out, not only in terms of renegotiating Greece’s debt, but also with regard to internal politics and social policies is open to speculation and wild imagination. As the world, therefore, either celebrates or condemns Syriza’s win, Greeks are once more confused. The political powers of the last forty years seem to have died with yesterday’s elections; however, remnants of it have made it to the government through the coalition. Tsipras will be the first Greek Prime Minister to ever take a political rather than religious oath during his swearing-in; but then he is also dependent on the support of nationalist party, which embraces religion as a pillar for the country’s wellbeing. Change is in the air but what the direction of this change will be is unclear. For Greece, and indeed for Syriza as well, this is not a time of celebration but a time of dealing with challenges, both the economic ones imposed as part of the country’s financial deals but also the social ones, so far largely neglected by the previous governments. 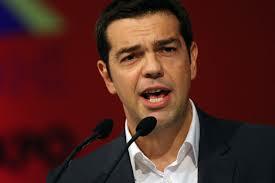 Because hope has indeed won in yesterday’s elections; but for the Greeks, this is their last hope. Maria Kyriakidou is a Lecturer in Cultural Politics, Communications and Media at the University of East Anglia. Her work focuses on the mediation of distant suffering, the role of representation in globalisation, cosmopolitanism and discourse theory. She is also interested in the way media discourses on the Euro Crisis construct and reproduce national stereotypes and divisive lines among the European counterparts. She holds a PhD in Media and Communications from the LSE and is an Associate to the Southern Europe International Affairs Programme of LSE IDEAS . This entry was posted in Greece, Maria Kyriakidou and tagged austerity, elections, Golden Dawn, SYRIZA. Bookmark the permalink.